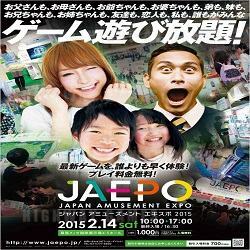 Japan Amusement Expo 2015 is one of the largest amusement machines and equipments exhibitions in the world and was created by the merging of the AOU show and the JAMMA show in Japan in 2012. Products and services displayed at the event include: coin-op, arcade game machines, amusement rides, play equipment, redemption prizes and machines, and equipment relative to the amusement and arcade industry - i.e. vending, cash and card systems, food and beverage, etc. Main exhibits are arcade game machines such as video game machines, sticker photos, simulation game machines, prize machines and medal game machines. Also, Sunday is open to the public for this show.